Ashampoo WinOptimizer 15 is a modern, particularly capable and intuitively operable suite for maintaining and optimizing your Microsoft Windows computer. Ashampoo WinOptimizer 15 users benefit from an efficient, quick and safe Windows maintenance as well as a large number of powerful and user-friendly tools which enable them to customize their Windows computer exactly according to their needs. Whether you’re looking to clean your Registry, clear out unnecessary programs that run on startup, undelete files, defragment your hard disk, optimize your internet connection, or perform a simple, one-click optimization, you’ll find it in Ashampoo WinOptimizer 15 And you’ll find a lot more as well. Ashampoo WinOptimizer 15 keeps your Windows installation free of unnecessary garbage and running smoothly while other computers just get slower and slower. With Ashampoo WinOptimizer 15, it’s so easy to tune Windows! To optimize its security functions, Ashampoo WinOptimizer 15 offers a backup. The program itself creates backups when necessary and stores them with a short description and the time they where created. Using the backup function you can reverse all changes made to the the Windows registry or important changes of the system configuration. Redundant files (e.g. temporary files), however, are not backed up here. Ashampoo WinOptimizer 2015 is designed to be as simple and intuitive as possible. Via the clearly structured Main window you can immediately access all function groups, in which over 30 modules with hundreds of options and functions are assembled. In addition, all the modules have the same layout, so as soon as you’ve learned how to use one module, you’ll feel at home in all of them. All the information you need is also displayed in the main dialog of each module or rather function. Ashampoo WinOptimizer 15 is normally priced at $39.99 per serial number / license key. But as part of the giveaway offer by Computer Bild, you can download Ashampoo WinOptimizer 15 full version with serial key for free for a limited time period only! 1. 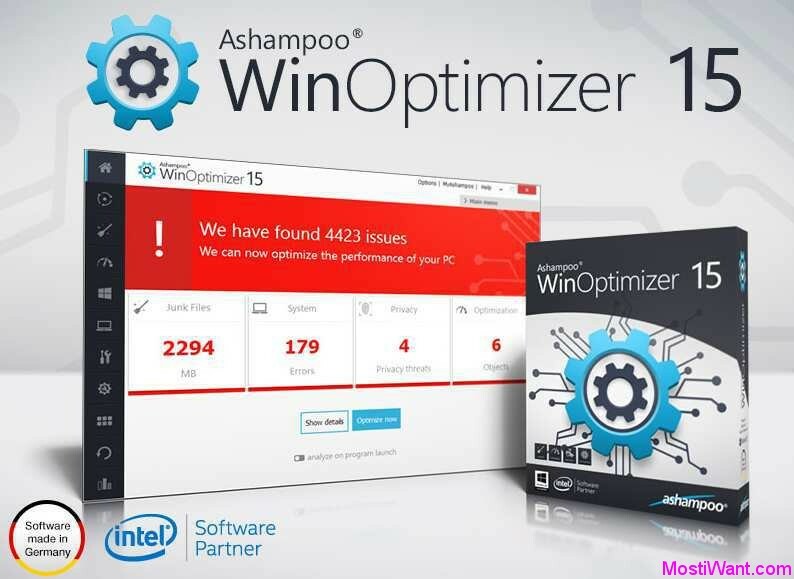 Visit this link to download the Ashampoo WinOptimizer 15 installer and install it (v15.00.05). 3. In that webpage, enter your e-mail address to grab your free full version Serial Number / License Key. To grab your free license key, existing users will need to log in with your password and new users will need to create a new Ashampoo account. Please note: in addition to registering for the free license key / serial number, you are also opting in to receive Ashampoo “service letters”. They will send you a nagging email every now and then asking you to upgrade to their latest version down the track (which I normally sent to my trash as soon as I got it). Although you can opt-out of letters after you register via MyAshampoo, it is better not to use your common-mail. 4. Use received license key to active the software and unlock installation process. Take note that Ashampoo WinOptimizer 15 may offer to download and install unnecessary bloatware that are not related to the core functionality. If this doesn’t suit you then choose “No, thank you” option when you’re asked. 5. Done, enjoy your free full version Ashampoo WinOptimizer 15. Ashampoo WinOptimizer 2018 is now released as freeware. Everyone can get Ashampoo WinOptimizer 2018 full version with serial key for totally free! Step by step guide to get Ashampoo WinOptimizer 2018 for free. Note: Ashampoo WinOptimizer 15 is more powerful than Ashampoo WinOptimizer 2018. Here is what WinOptimizer 2018 is missing from WinOptimizer 15: Registry Defrag, Disk Defrag, SSD Wizard, User-Rights Manager, Disk Doctor, Undeleter, Duplicate Finder, System Restore Manager, Icon Saver. Ashampoo Winoptimizer 12 is a very nice piece of software. Thanks William and Ashampoo for this great gift. Hi sharemore, Thanks very much for sending in the news and very sorry for my delayed response. Have a nice Day! Thanks. Now I get this message: Action has not been started. Thank you very much, Zsolt! Have a lovely day! Be very careful. Make sure you have a good backup. I actually bought this software when it first came out because I use a lot of Ashampoo software and have been very happy with it. I am running Windows 8.1 and after running this software my computer is no longer able to update. Have been trying for months and cannot get it fixed. Looks like I will have to re-install Windows. You are welcome Elijah! May your Christmas be as full of joys! Nice find, thank you Sopon! many more licenses works mostly with the normal installer from the download page. Version 01.00.00, 1970/01/01 | Trial License After the trial period you have to purchase a license key for the full version, in order to continue to use the program. The trial license is completely free and without obligations. Really Nice find, Chris P! However, I believe that many of those keys will only be accepted on specific giveaway editions which can not be download from official website. Anyway, thank you very much for sharing. Have a lovely day! Burning Studio 12 worked fine. But Snap 6 seem to be 40 day Trial Licenses only. Atleast the numbers i tested said 40 day version only. If you have other numbers for that, it would be nice if you could post them. For ashampoo, we can easily get English page by update the URL with ‘?session_langid=2’ for English while originally it is ‘?session_langid=1’ is for German. Thanks again for your nice work. Nice tips! Thank you so much for sharing, Wilson. Have a lovely day! Hi, recently I compared WO 9 and WO 2013. Wow, good job, thanks RealBull! Hi Bob, thanks, I agree with you. BTW, what is the difference between the numbered versions (Ashampoo 7,8,9,10 etc.) and the Yearly versions (Ashampoo 2012, 2013, etc.)??? Thanks for this nice find! Sorry, I’m referring to Ashampoo WinOptimizer. What is/are the differnce(s)? Thanks for reminding me the giveaway offer of Ashampoo Uninstaller 4. The Ashampoo WinOptimizer 2013 is a special version build based on WinOptimizer 9. They are almost the same. And, seems that the Yearly versions do not have the “live tuner” feature.